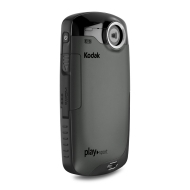 alaTest has collected and analyzed 2690 reviews of Kodak Playsport ZX3. The average rating for this product is 3.8/5, compared to an average rating of 4.1/5 for other Camcorders for all reviews. People really like the size and image quality. The price and portability also get good feedback. Some have doubts about the viewfinder and connectivity. Views about the zoom and battery are mixed. We analyzed user and expert ratings, product age and more factors. Compared to other Camcorders the Kodak Playsport ZX3 is awarded an overall alaScore™ of 88/100 = Very good quality. A revision of the likable Kodak PlaySport Zx1 model we tested last year, the of this camcorder has much improved controls and feels great in the hand. Good points: block shape means good for quick shots, irritating for long shots. Good quality video. Very rugged, and waterproof to 10 feet, making it superbly flexible. Very simple controls. Drawbacks: Relatively weak still photos. Lens focal range:39.4" - ∞ / 39.4" -?